New Smart Fortwo now on sale | What Car? 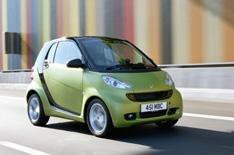 A revised version of the Smart Fortwo is now on sale, with new styling, extra equipment and lower CO2 emissions. The most obvious changes are to the looks of the car, with the front and rear aprons, side skirts and filler cap now body-coloured on every model. Pulse and Xclusive models get new designs of alloy wheels, while Pulse and Passion models are available in bright new blue and green colours. Theres a new-look upper dashboard, as well as extra stowage in the shape of a redesigned glovebox and pockets on the seat side bolsters. Pulse and Passion models also have a new design of steering wheel, while three new fabric patterns are available on Passion models. The range also gains more high-tech equipment, with USB/iPod connectivity on Pulse models and a touch-screen sat-nav/audio system on Passion and Xclusive models. The same engines as before power the car, but revisions to the entry-level 1.0-litre petrol unit mean its CO2 emissions are now just 97g/km. At the same time, although the revised Xclusive models are a second quicker to 60mph dispatching the benchmark sprint in 8.9 seconds they too have lower emissions than before. With figures of 119g/km on these flagship models, the entire range now has emissions of less than 120g/km and less than 100g/km on the most popular versions which means that every model is exempt from road tax for at least the first year of registration. The changes apply to both coupe and cabriolet versions of the Fortwo, and the revised cars are on sale now, with prices starting at 8780.